Last spring, I attended the Mother Earth News Fair in Asheville, primarily to take in a series of seminars on beekeeping. In between sessions, I wandered into a presentation on soil blocking, which I had heard of, but hadn't really given much thought. As these things so often turn out, I decided that beekeeping is not something I am ready to take on right now, but soil blocking is something I definitely want to give a try. There is no need to purchase pots, ultimately saving money. Transplanting is easier, with less risk of shock. More plants can typically be started in a smaller space. Each of these advantages, however, comes with a caveat, which is why the concept has been slow to gain acceptance among casual gardeners. Although soil blocking does not require pots, there is an upfront cost; the blocking device which will cost anywhere from $25-$90, depending on size. For moderate volume home gardeners, this cost would likely be offset in the first year or second. For the small gardener who is only starting a half dozen pepper and tomato plants annually, though, the payback period would be quite long. With soil blocks, the plant roots grow to the edge, then stop when they contact the air space between blocks. This prevents the transplant shock that is caused by removing seedlings from a plastic container where the all-important root tips are inevitably damaged. However, the soil blocks are relatively fragile and do not tolerate much handling. That's why you almost never see blocked seedlings in garden centers or even farmers' markets; they simply do not hold up well in a retail environment. So, if you produce seedlings for resale, soil blocking may not be a viable option. Finally, although the ability to produce literally thousands of seedlings in a small greenhouse space is a boon for commercial growers, the downside is that, unlike potted seedlings which can grow for months - albeit rootbound - in their pots, soil blocks have a short lifespan. Essentially, the process needs to be timed so that the seedlings can be placed in the ground right about the time the roots reach the edge. While this is no problem whatsoever for commercial growers, the home gardener might find this calculation somewhat daunting. With all those things in mind and having decided to give the technique a try, I first needed to purchase the blocking device. 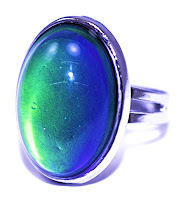 The leading manufacturer of these is a company called Ladbrooke. They are available in a variety of different sizes from "micro" which produces twenty 3/4" blocks at a time to the extra large, which produces one 4" block. I split the difference and bought one which produces five 1 1/2" inch blocks. Soil blockers are available online from just about any garden supply store. I got mine from Amazon for $30. This is probably a good point to stop and make note of the fact that I am not coming at this from an "expert" standpoint. 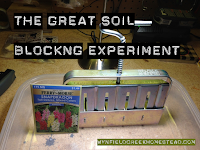 Although I have extensive general gardening experience and am a certified Square Foot Gardening instructor, this is the first time I've tried soil blocking, and I am simply sharing my experiences, whether they be positive or negative. Basically, I am repeating what I learned in a one hour class nine months ago, so please do not take anything I am writing on this topic as "gospel." The next step is to prepare the soil mix. As you might imagine, regular seed starting soil will not work well in a soil blocker. The soil formulation needs to be such that the roots have nourishment and space to grow, but sufficiently "tacky" for the block to maintain its shape. There are a number of different recipes for making this soil and premixed versions are available from several online sources. Some of the recipes require unusual ingredients, like clay dust, that you will not find at your local garden center, and if you have to send away for the ingredients - unless you are planning to make a LOT - you might as well just buy the premixed soil. Fortunately, I found a couple of recipes which do not require anything exotic and I will be starting out with one that somewhat resembles the Mel's Mix I use for Square Foot Gardening. This soil blocking formulation is two parts peat moss, one part horticultural vermiculite and one part commercial garden soil. Simple enough. Just a quick note on the vermiculite: If you have attended one of my Square Foot Gardening workshops, you know that I am an absolute stickler for using ONLY coarse grade vermiculite. For soil blocking, however, use the more common "horticultural" or medium-fine grade. In this formulation, the vermiculite acts not only as a water retention medium, but as a binder that helps hold the block together. Medium-fine vermiculite has a sand-like consistency that works well in this regard, while coarse grade is the size of small corn kernels and does not. The three ingredients should be mixed thoroughly together in a deep (at least 6 inches) pan or bucket. One you have a homogenous mixture begin adding water and continue mixing until the soil is the consistency of oatmeal. It should not be liquid mud, but a handful of the mixture should yield a few drops of water when squeezed. Once the soil has reached this consistency, put it aside for a few hours to allow the moisture to evenly disperse. When you are ready to make your soil blocks, mix the soil one more time with your hands or a trowel and make the surface roughly flat and even. Next, take the blocking device and press it down into the soil with a rocking and twisting motion. The idea is to fill all of the cavities completely and evenly. Do this twice more, applying firm pressure, to compress the soil in the cavities. Use the edge of the pan or bucket to scrape the excess soil from the bottom of the blocker and place the blocker in a seed starting tray. Depress the plunger on the top of the blocker while simultaneously lifting the device. The result should be a row of square soil blocks, each with a small divot in the center. Repeat this process until the tray is full, leaving about 1/8 inch air space between the rows. It doesn't take long to get the hang of this, but your first couple of tries will likely be a little shaky. That's okay; you can always just return the soil to the pan, mix it back in and try again. From this point forward, the seed starting process is pretty similar to the typical plastic or peat pot variety. I am using snapdragon seeds for this experiment for two reasons; I like snapdragons, and they can tolerate frost. If all goes as planned, these seedlings will need to go in the ground in late February and that's well before our frost-safe date here. Since snapdragons are a surface-sown seed, the divot in the top of the block isn't important. but if this were a larger seed or a seed that needs to be covered to germinate I would place the seed at the bottom of the divot and sprinkle a bit of loose soil on top. Once all of the blocks are seeded, place the whole tray on a heated seed starting mat either in a greenhouse or with a plastic cover to retain humidity. Mist the blocks once or twice daily to keep them moist. Do NOT allow water to stand in the bottom of the tray or spray the blocks with too much pressure, for obvious reasons. After an unusually warm spell around the holidays -- it was 75 here on Christmas -- temperatures have returned to more seasonal levels. No one is ever going to mistake the North Carolina Piedmont for the frozen tundra, but we do have a little bit of winter here, with sub-freezing nights and even the occasional snowfall possible from mid-December until the end of February. This little cold snap makes me think about cozying up to a nice fire, and today I'd like to share some tips for cutting firewood and choosing a wood-burning stove. I'd like to, but truth be known, I'm not much of an expert in those areas. The house where I grew up in frigid northwest Ohio did not have a fireplace... well not a real one anyway. 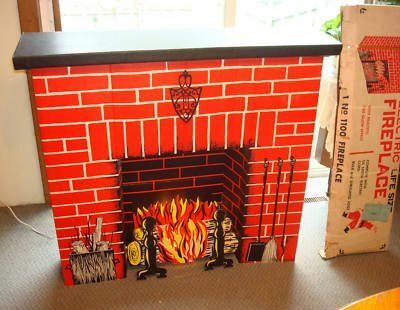 For Christmas one year when I was 8 or 9, Dad brought home a cardboard "Electric Christmas Fireplace" complete with cardboard logs, a cardboard mantle and a "fire" that consisted of an orange light bulb behind a translucent window painted to look like flames. It was extremely cheesy, even for a throw-away Christmas decoration, but we liked it so much -- well, Dad and I liked it so much -- that we left it up for several months after Christmas had passed. Finally, Mom had enough and told Dad that if he wanted a fake fireplace, he should at least get one that didn't look like something out of a 3rd grade holiday pageant. So he did. Our fireplace 2.0 was made of wood and fake brick and while not exactly "classy," was at least vaguely furniture-like. I spent many cold winter nights sitting in front of its incandescent glow, reading adventure stories and pretending I was in a remote mountain cabin somewhere. A few years later, Dad decided that the fake fireplace in the living room was nice and all, but he wanted a real wood-burning stove for the basement. Despite being a damp, dark space we spent a surprising amount of time in our basement. We had a gas oven, a refrigerator, a freezer, a workbench and our washer and dryer down there. Dad used it as an auxiliary workspace when it was too cold to work out in his tool shed, Mom did the laundry and sometimes cooked down there --especially in the summer when the kitchen was too hot -- and I had a workbench/desk/laboratory. Although it stayed pleasantly cool in the summer, the basement got downright cold in the winter. Dad was reluctant to use an electric space heater down there, because puddles of water frequently formed on sections of the concrete floor. Further, he had an ingrained fear of oil stoves; not surprising since his mother was burned to death while filling one. Instead, Dad decided that he wanted a pot belly stove and one fine winter day we set off in search of one. For reasons I no longer remember, my younger nephews Todd and Troy went along on that trip. We ended up at a farm supply store in the nearby town of Norwalk, where they, against all odds, actually had a couple of different models to choose from. Dad examined each carefully, opening and closing the round door vent on the front and sliding the grate on the bottom. When he finally seemed to have decided on the smaller model, he hailed a salesperson who ambled over and inquired with an anachronistic Southern drawl, "hep y'ith sumthin?" "Yes, I'm interested in getting one of these." "Does this stove burn wood?" Now, to fully appreciate this question, you have to understand my father. He would occasionally say completely off the wall things, just to see people's reactions. That apple didn't fall far from the tree; I do the same thing. Still, this was a very strange inquiry, to say the least. Maybe he was trying to make a joke. Maybe he was trying to put the salesperson at ease with a quirky remark. Or maybe he had a real question that simply didn't come out right. Whatever his motivation, my nephews and I thought this was the funniest thing we had ever heard. To this day, whenever we get together and the conversation turns to "grandpa," one of us will ask, "does this stove burn wood?" and the other two will break out laughing. Dad got the last laugh, though. A year later, the infamous "Blizzard of '78" hit northwest Ohio, with several feet of snow and sub zero temperatures. Our electricity went out in the first hour of the storm and we had no heat in the main part of the house, but down in the basement, Dad's pot belly stove did indeed burn wood, and kept us all warm until the electricity was restored almost a week later.